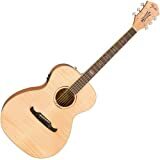 Fender T-Bucket 300 CE Guitar Review 2019 – is the Fender T-Bucket 300 CE acoustic guitar worth the money? Review of features, pricing, design, sound and more. Fender T-Bucket range of guitars were designed as mid-range, affordable acoustic guitars which would still give you a very decent quality sound and would be suitable for a range of activities—performing on stage, practicing on home or at intimate concerts, having one of them as a second guitar, and so on. In this Fender T-Bucket 300 CE Guitar Review, we will touch on some of the basic and essential aspects of this model, including sound, tone, body and build of the guitar, quality of the built-in electronics, and perhaps the most salient question of all—if the model gives you value for money. To start with, the T-bucket CE is a cutaway dreadnought model. The guitar gives you a rich, full-bodied sound (thanks partly to its quality maple top and artfully arranged scalloped bracing), however many users concur on this point that the sound is not as overly full or resonant as you would normally expect from a dreadnought. That said, the sound is crisp and full enough with enough clarity to go with it and considering that this is not a $1,500 model, there should be no cause for dissatisfaction as far as the sound is concerned. More or less, the same goes for the tone of the guitar as well. It is somewhat difficult to communicate the exact feel of the sound and tone of a guitar through the means of words alone. So, as we always say, if you are considering buying the model, the best thing to do is to visit a good guitar store near you and try out the model yourself. Alternatively, you may also check some demo or review videos (there are a lot you can find on Youtube) devoted to any particular guitar model and this will also help you get a good idea of the tone and sound of that model. In our own appraisal, however, the tone of this model sounds bright—actually more bright than warm. So, on a scale of 10 going up from warm to bright, we may give it a 6, probably. So, yes, the tone is more on the brighter side. The guitar, as is already mentioned, is a dreadnought i.e., a large, full-bodied guitar with the ‘C’ of the model name obviously referring to the fact that it is a cutaway which gives you easier access to the upper frets of its 20-fret fingerboard. The Top Wood is made of quality laminated maple. Now, apart from its intrinsic qualities, many actually love the T-Bucket models since it gives them a huge range of choice when it comes to the color of the guitar, which is basically the color of the top wood. You have as many as ten choices including blue, amber, transparent blue, cherry Burst, 3-color Sunburst, Black, Honey Burst, Green and Moonlight Burst. Some of these have Quilt Maple, others Flame Maple and still others come with Laminated Quilt Ash Maple. The Back and the Sides are of laminated mahogany and so is the neck. As for the bridge and the fingerboard, they are made of rosewood, just as you would expect. But what is special with this model is that it uses GraphTech NuBone both for the nut and the compensated saddle. This is not too common for steel string acoustic guitars of this range, many of which would simply use plastic nuts and saddle that are often responsible for extra vibration and takes away from the tonal clarity and consistency of the sound. So, again the nut and the saddle part of the T-Bucket stand out. The Scale Length of the guitar is a standard 643mm but one important thing to note with this model is that at 41.3 mm, the width of the nut is narrower compared to most models of this sort of size and make. Why we mention this is that many, especially those who do not have long and wiry fingers, prefer narrow nut width since this goes easier on the fingers and you are less likely to suffer from finger soreness when you are playing this model. Since we are on this, it is also a good time to mention that the Action of this guitar is rather low. For a first, a low action means the model is ideal for beginners (for whom it is difficult to start out with a high action fretboard) as well as for guitarists who mainly play on electric models. With its onboard pickup system, this model will also work great with those who want to hit the stage with it. It uses the patented Fishman® Isys III onboard pickup system complete with tone and volume controls, active preamp as well as a built-in tuner. According to most users, the electronics work pretty decently and the tone and volume control features enable the player to shape the amplified voice of the model to match any venue they are performing at. Many, however, seem to have an issue with the tuner which apparently does not do a great job when it comes to tuning the guitar especially for playing long sessions. However, this is a known fact that built-in tuners, no matter what model, aren’t too reliable. So, we don’t think you need to pay any great attention to this. Of course, it would have been nice if the model had an open back tuner (as in the T-Bucket 400 CE model) rather than a sealed unit as in this model. However, we can’t have it all (!) and as we said, this is not a big deal at any rate. Well, that is pretty much it. In our estimation, Fender T-bucket 300 CE is a decent enough model at the $300 price range and you do get enough value for money with this product. In fact, Fender has already made a good name for itself in the ‘under $500’ acoustic market thanks mainly to models like those you find in the T-Bucket Series (apart from the one here, you have 400 CE and 300 CE Full Bass as part of the series) as well as models such as Fender Sonoran SCE and Fender FA 135 CE. Both of the latter come with a somewhat higher price tag compared to a T-Bucket and include some superior features. But, importantly, all of these Fender CE models give you good sound, great tone and superior tonal consistency and these are what, we assume, most guitarists will prize above anything else. Based upon feedback submitted by over 5 customers the Fender T-Bucket 300 CE Guitar has received an average 4.5 out of 5 star rating. We discuss why in this review article.